So this begins with Kompany on the ball. He’s just intercepted a poor pass. Kompany goes forward and makes a pass to Origi. His pass isn’t really much of a pass and I almost feel like calling it a pass insults actual passes. You’ll also notice he’s vastly more forward than Van Buyten, who isn’t even in this screenshot. Mascherano intercepts it. 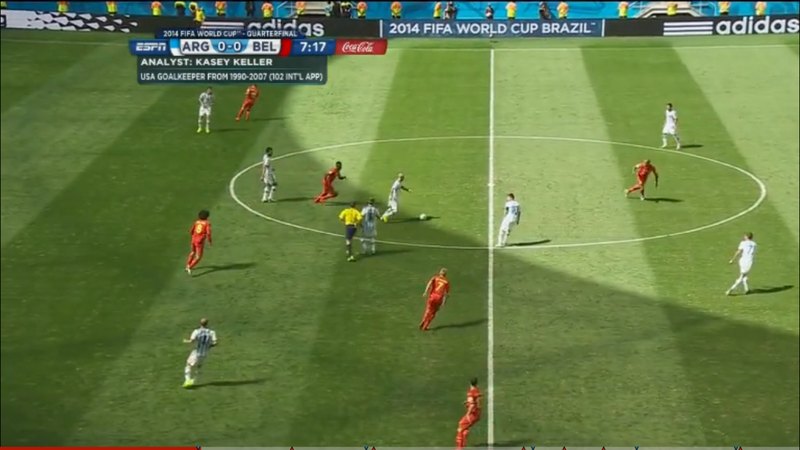 You can see Kompany in the center circle high tailing back to a more defensive position. 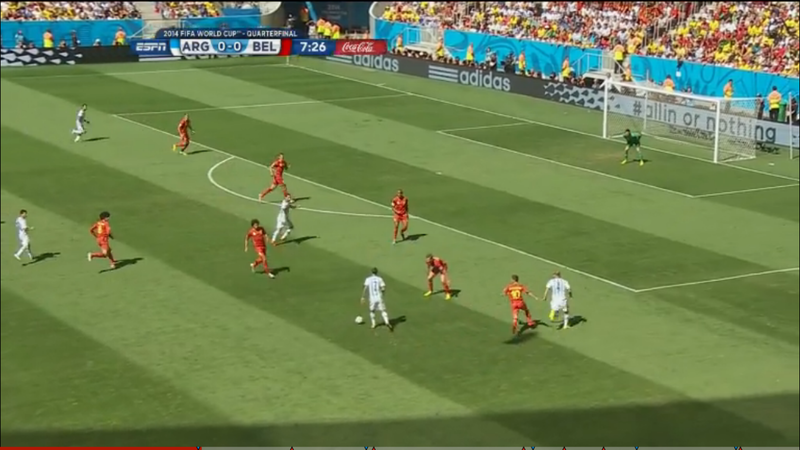 You’ll notice Messi is pretty close and open, and Mascherano decides to pass it to him. Good idea, Javier. De Bruyne realizes that someone should try to mark Messi. De Bruyne doesn’t do a particularly good job at marking Messi as you can see by the fact he’s off balance and falling away. 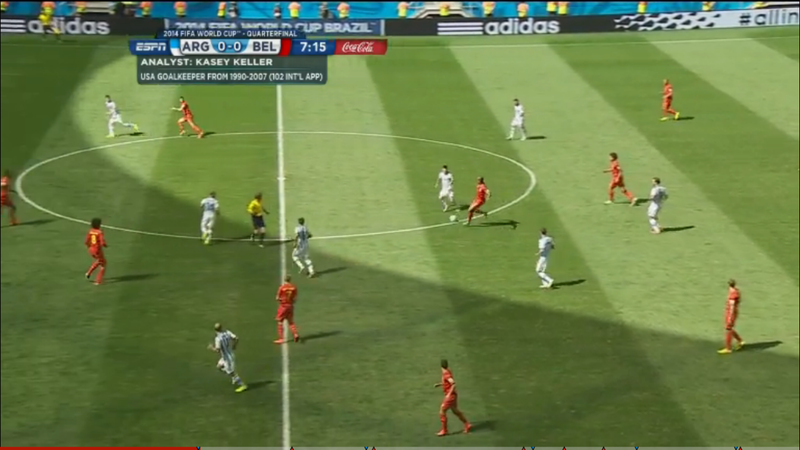 Fellaini, in the center circle, realizes he should probably try to mark Messi because KDB isn’t doing that great with it. So now there’s two guys on Messi along with Witsel watching him. 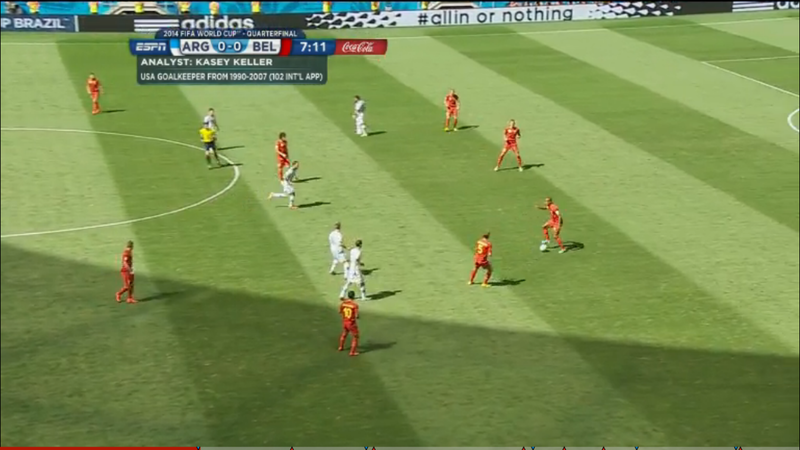 Messi does a little spin move and he has plenty of space to make the pass to Di Maria who is cut off at the edge of this screenshot. You’ll also notice no one is that close to Higuain. Zabaleta is next to Hazard is on the verge of making a run. Messi makes his pass to Di Maria. 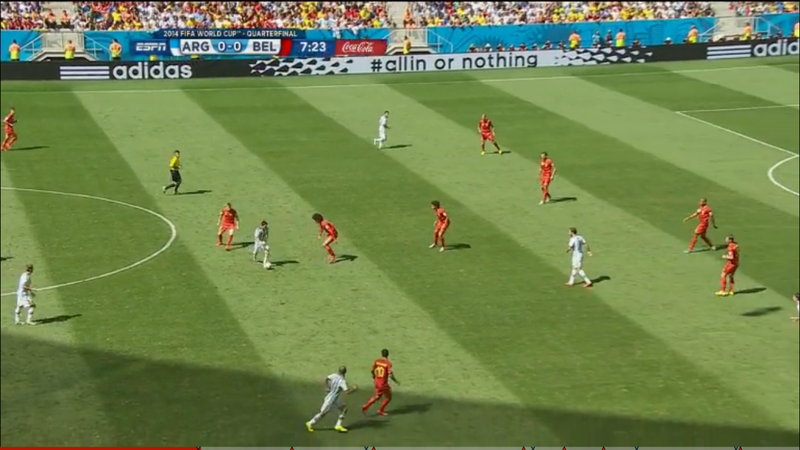 Vertonghen isn’t really close to Di Maria since in the prior screenshot his attention is focused on seeing if Messi is going to keep running with the ball. The ball’s at Di Maria’s feet now. 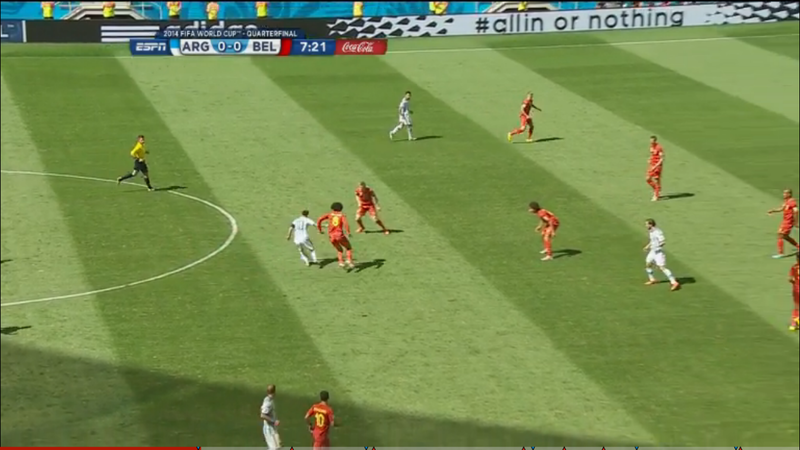 Fellaini isn’t as deep as Belgium would want because he was trying to stop Messi. 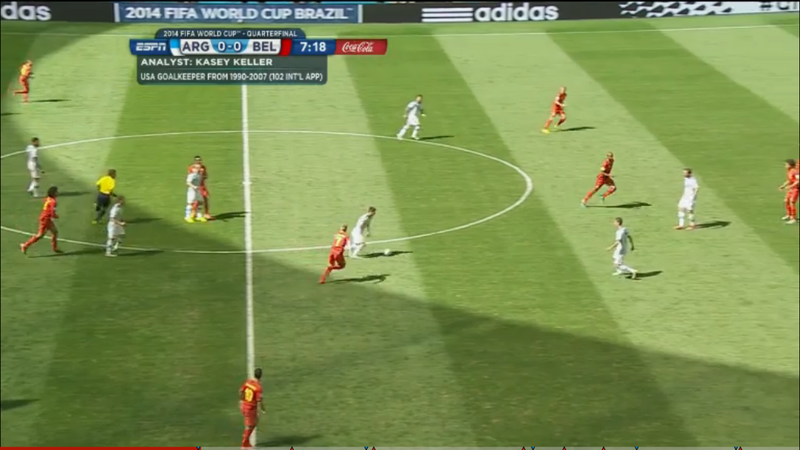 You’ll also notice Zabaleta is on the overlap, being marked by Hazard. Di Maria cuts in now and Zabaleta is past Hazard and Di Maria can choose to play through Zabaleta or find Higuain. 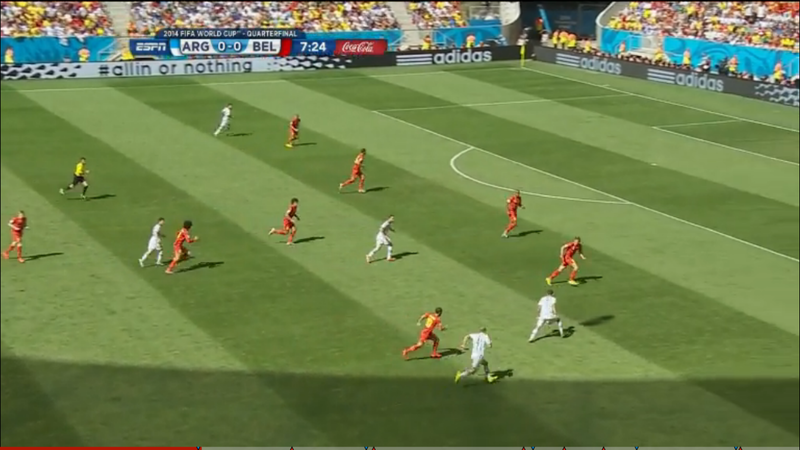 Zabaleta now has clear separation and Di Maria is about to make his pass to him. The pass doesn’t reach Zabaleta though, as Vertonghen deflects it. You’ll notice Kompany was already moving towards Zabaleta. 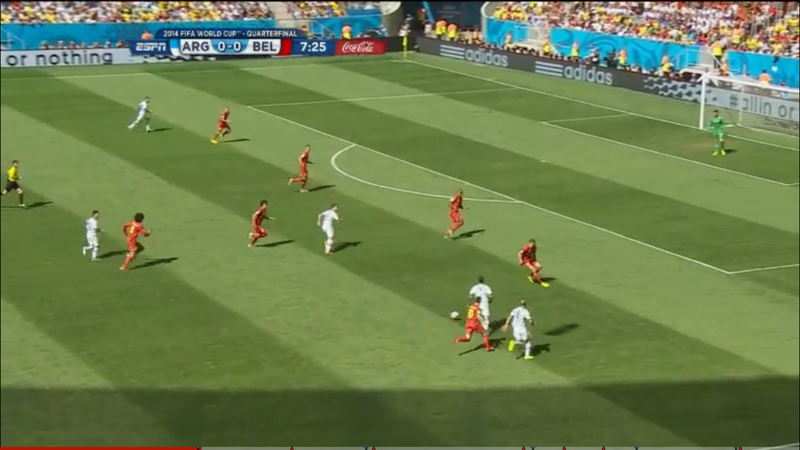 The deflection finds it way to go towards Higuain with neither Van Buyten or Kompany very close to him. 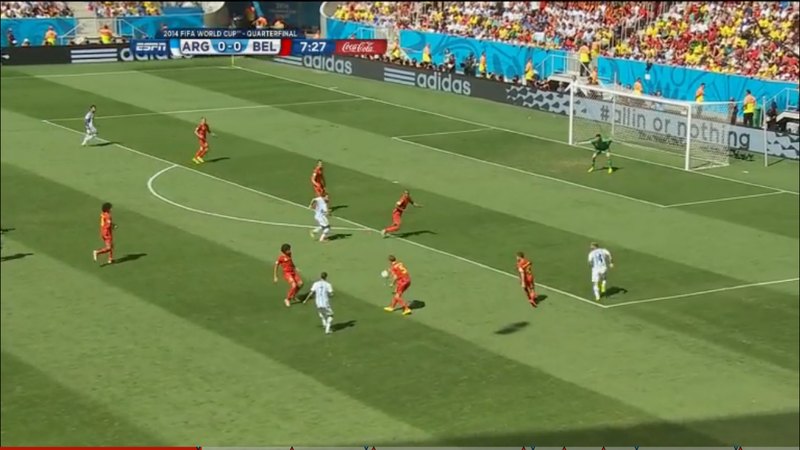 From there, Higuain hits a pretty great half volley. 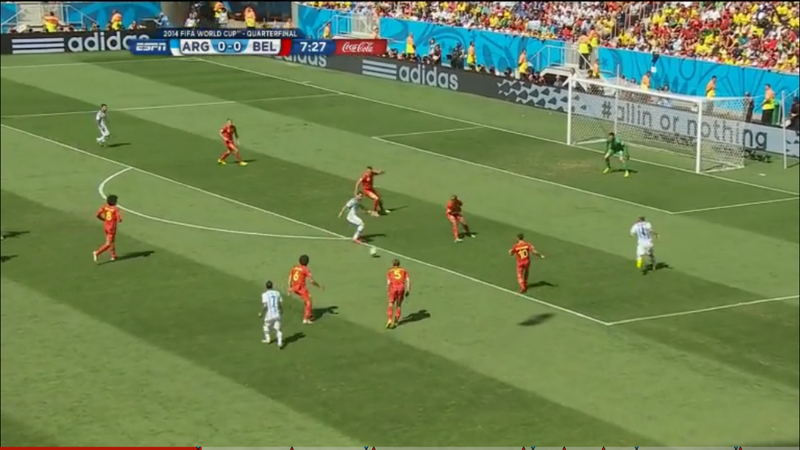 Kompany and Messi are the people most responsible for this goal. Kompany’s poor pass left him out of position and him committing to Zabaleta on Di Maria’s pass gave Higuain the room to shoot. You can’t fault Kompany for the latter but where he was allowed Higuain score. Messi drew in both De Bruyne and Fellaini and then made a well placed pass that lead to the goal.